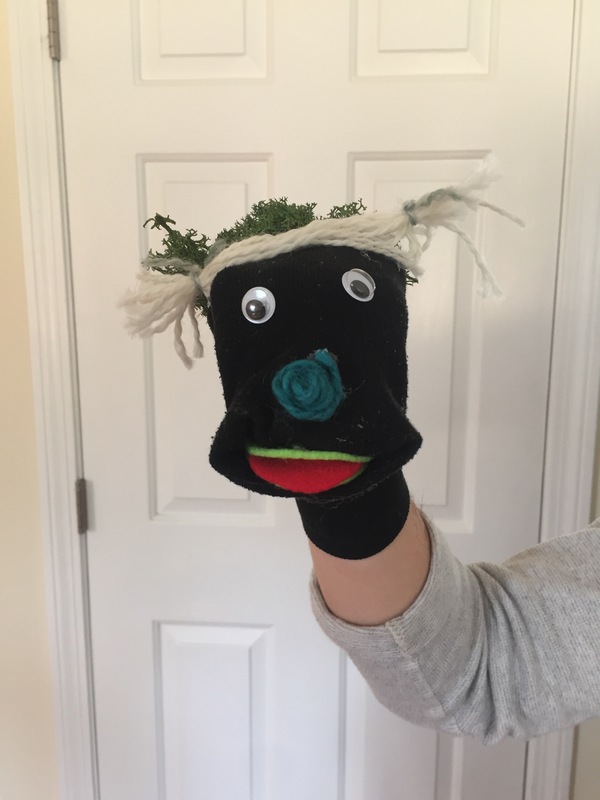 Fun Kid Craft ~ Sock Puppets! 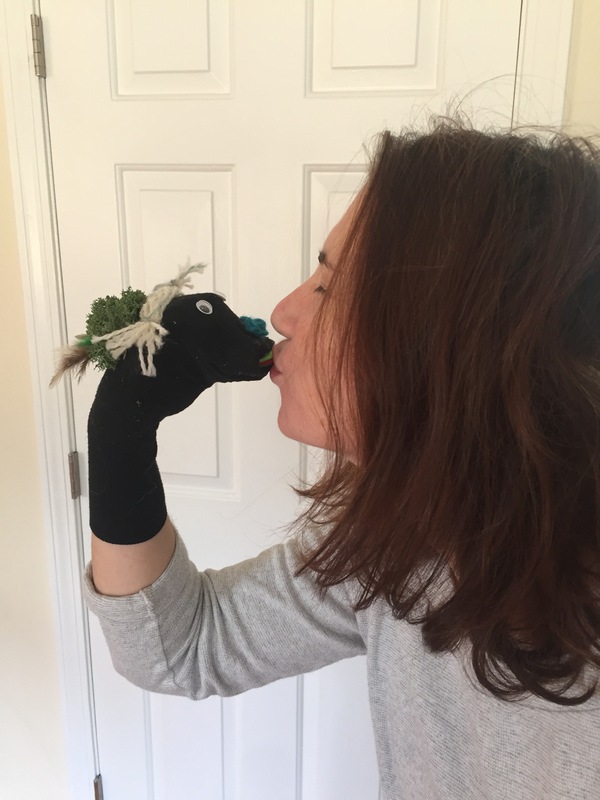 I’ve been meaning to write a post about sock puppets for months! But, you know… life. 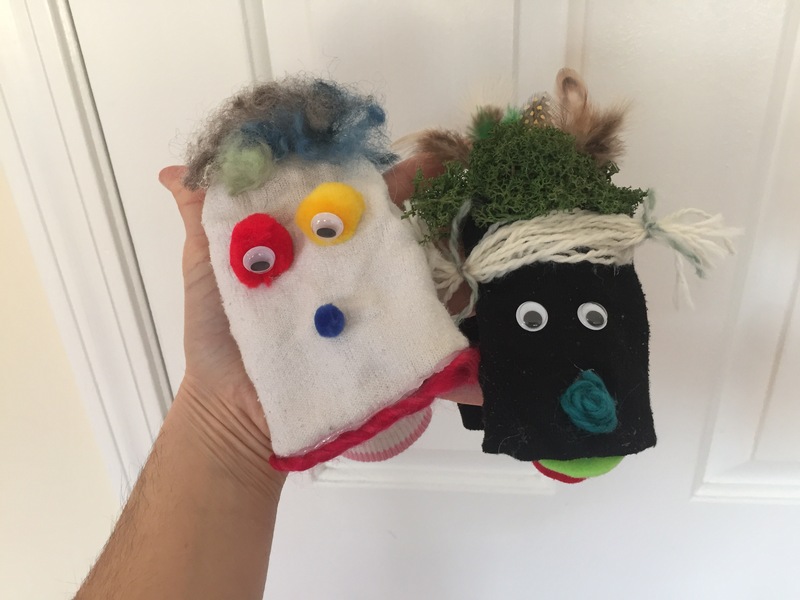 I was reminded of these hilarious characters when I read through the stupendous thank you notes I received from the kids in my son’s class for all the activities we did over the year. 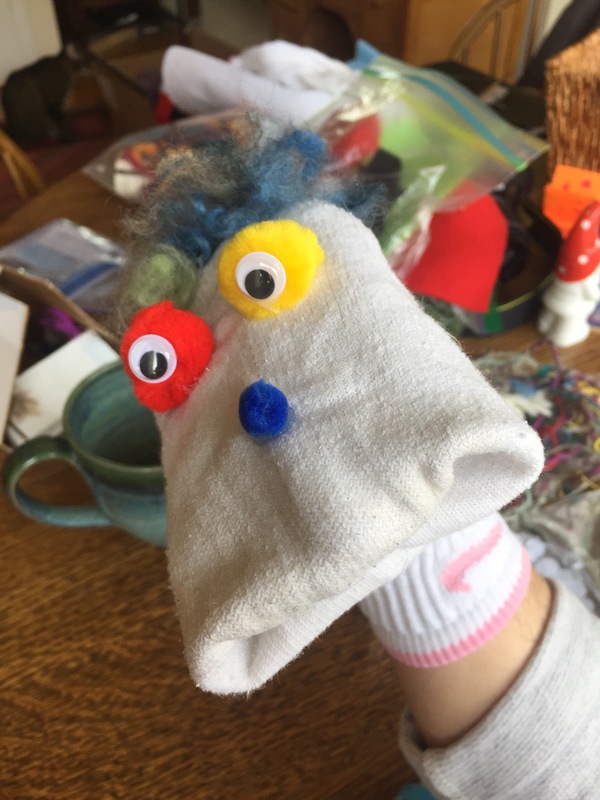 A large number of them said making sock puppets was one of their favorite activities. So, of course I should share what we did! #1: Gather socks you are willing to separate from. Got any loose ones kicking around, lonesome without their mate? #3: Get glue ready. 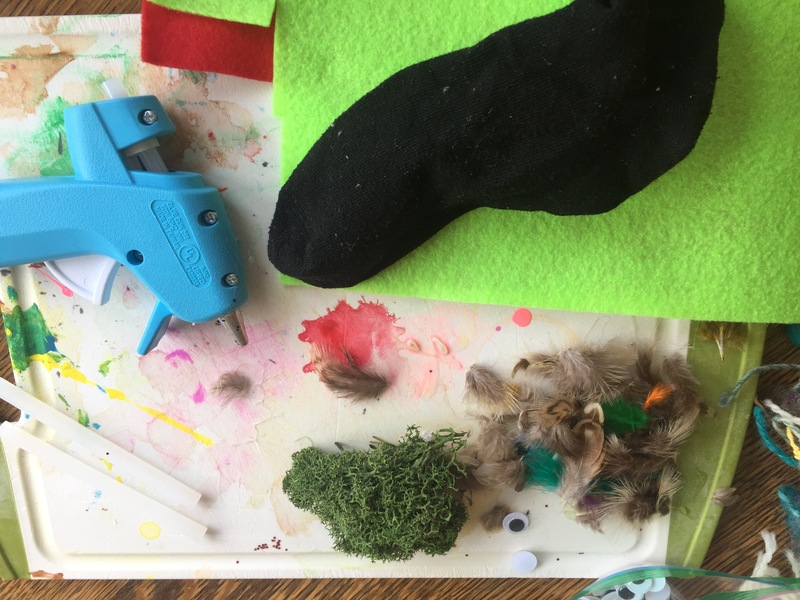 I found my glue gun to be the most effective but standard glue works, too. Clear glue is better because you don’t see it once it dries. 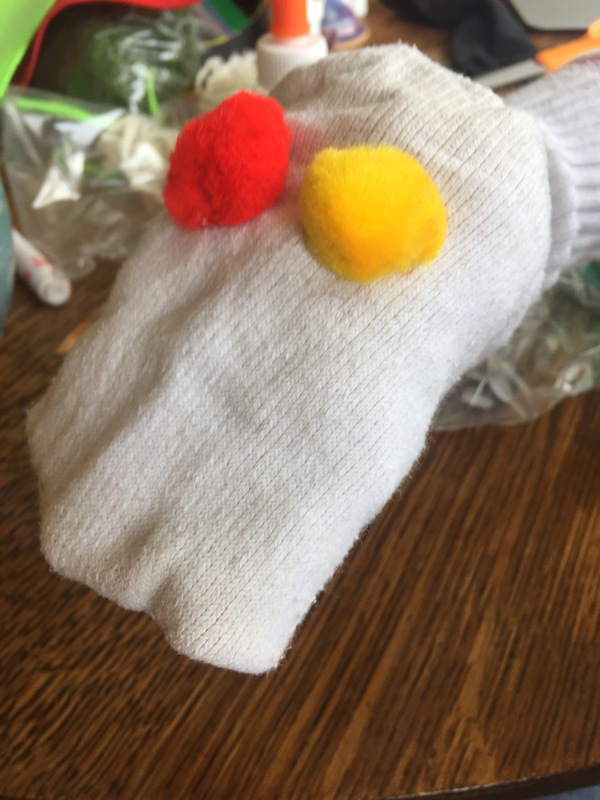 #4: Arrange sock on hand. 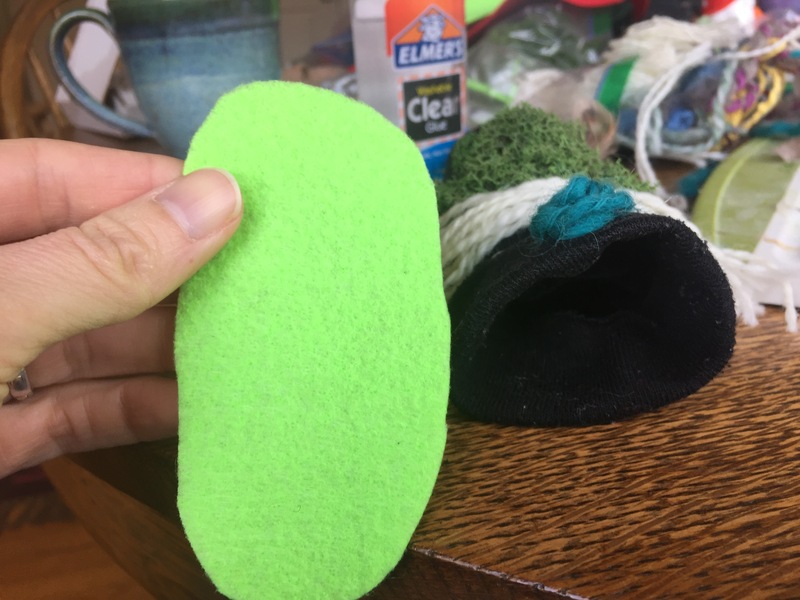 I find that the heel of the sock fits nicely over the knuckles. 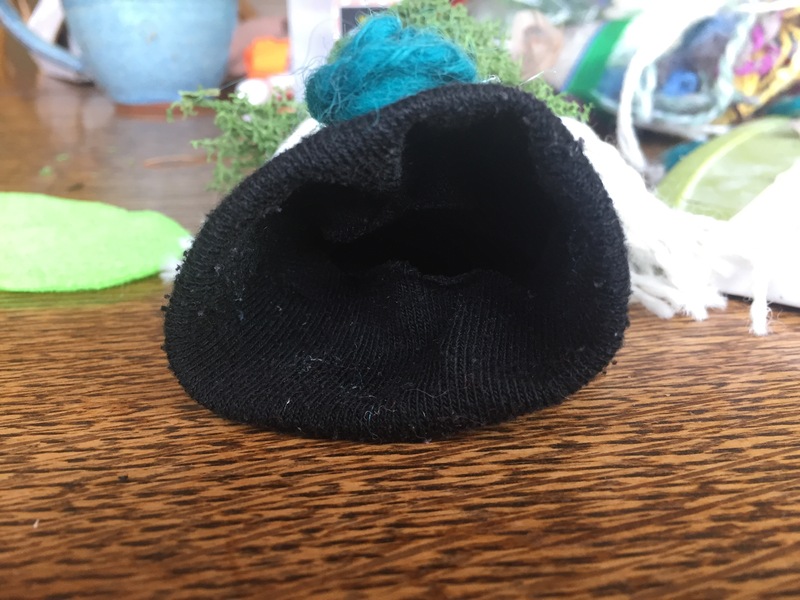 When you open you hand, keeping your fingers together and away from your thumb, you can tuck the extra sock fabric that would otherwise be around your toes, into that space, creating the mouth. 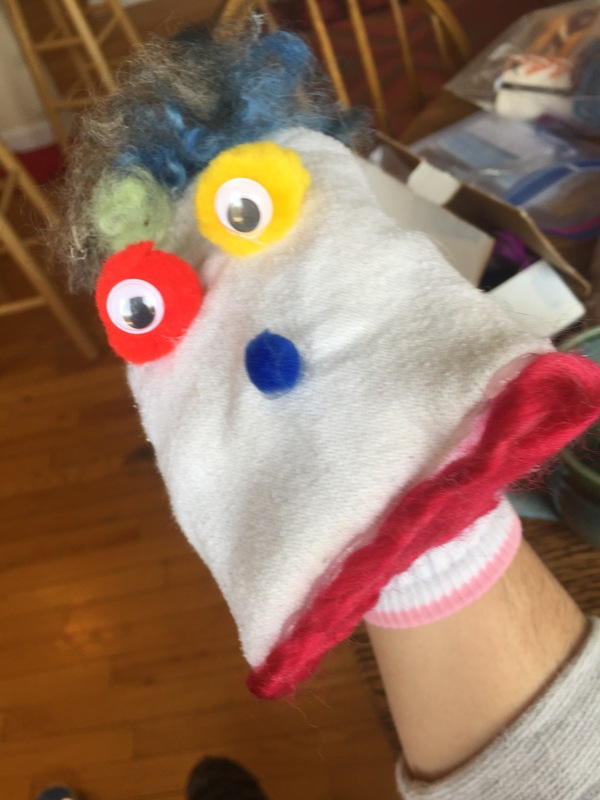 Close your hand, holding the mouth in place, and glue on the eyes where you want them. 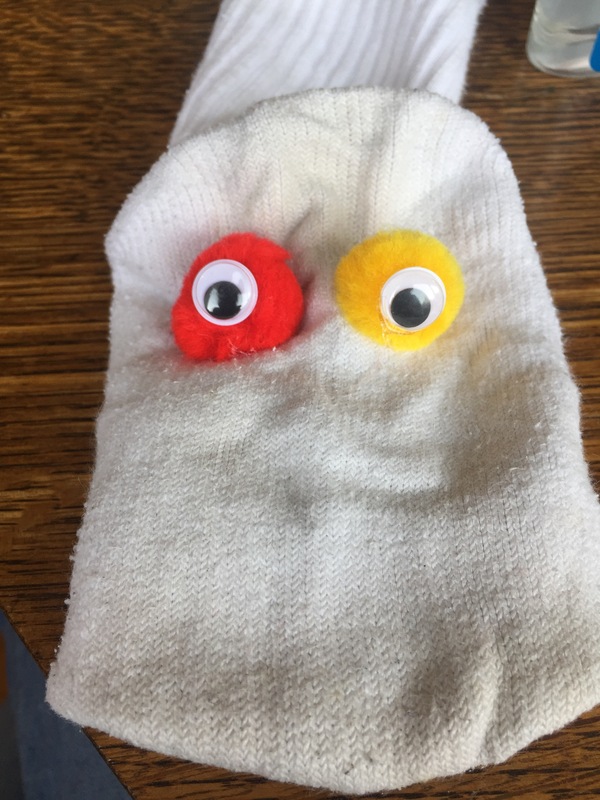 Then, gently remove the sock and lay it on the table. #5: Notice the personality that is already evident! Amazing, what eyes do. 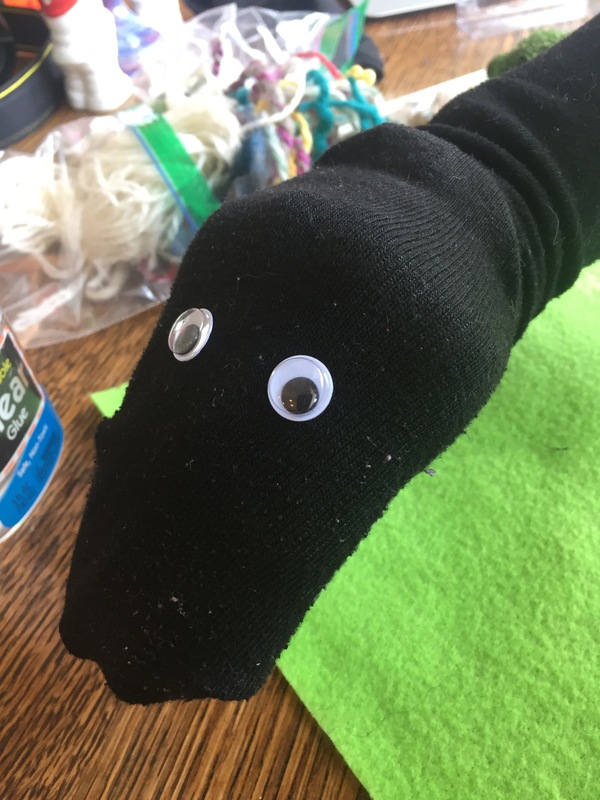 👀 Start adding whatever you want to your puppet, being careful not to overglue. You don’t want the sock to stick to itself. 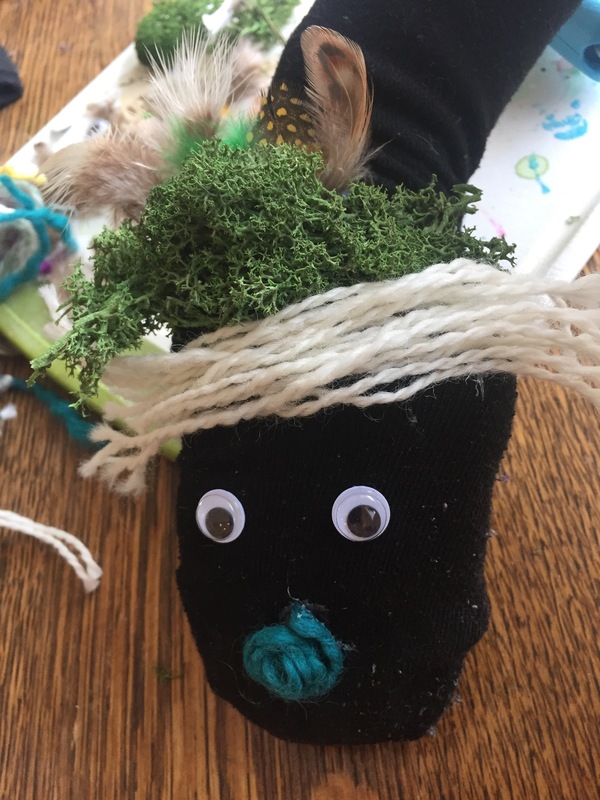 On mine I knew mossy hair was necessary, and feathers. #6: after the adornments dried for a few minutes, I started on the mouth. I propped open the space designated for the mouth and eye-balled the size. 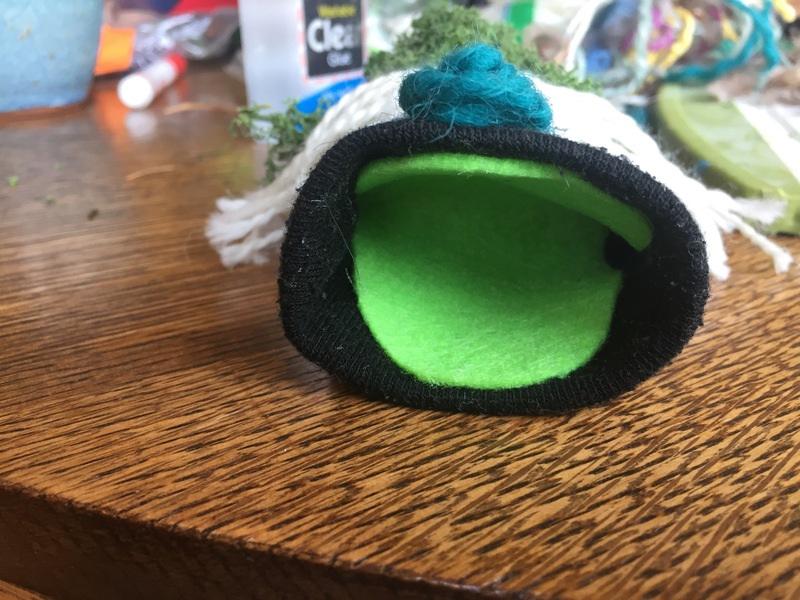 I tucked it into the sock mouth to ensure a good fit, then took it out, put glue around the edges of the felt, and tucked it back in there. 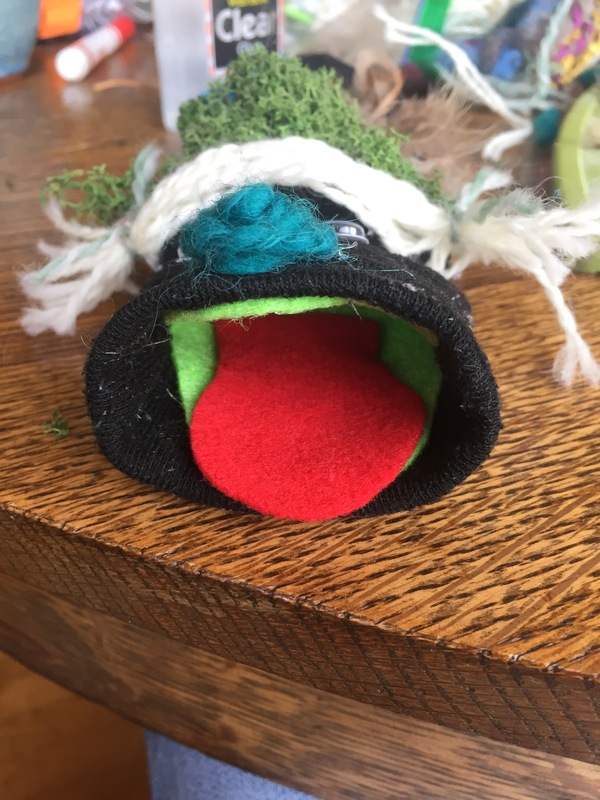 Then I added a felt tongue which was simply a smaller oval with one side cut off. #7: And Voila! You can introduce yourself to your new friend! Here’s another one I made with a tube sock. Ugh, do I need to use bleach? Shiny red yarn for a lovely lip expression. This took a little patience as the yarn needed ample time to dry in order to withstand this character’s rather loud voice. 👉 They are inexpensive to make. 👉 They require only as much detail as you feel like giving them. 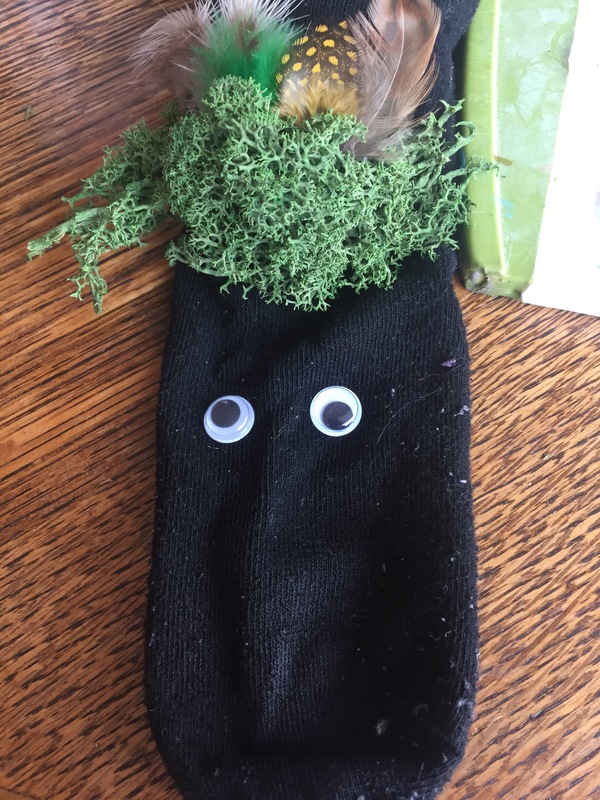 A sock with a mouth on its own is fun. Each thing you add gives it more flavor. 👉 Patience is needed, and flexibility in expectations ~ both good things for projects to support us in practicing. Sometimes we gotta weight for glue to dry. Sometimes we don’t know how to make top hats. 👉 Puppet shows never get old. 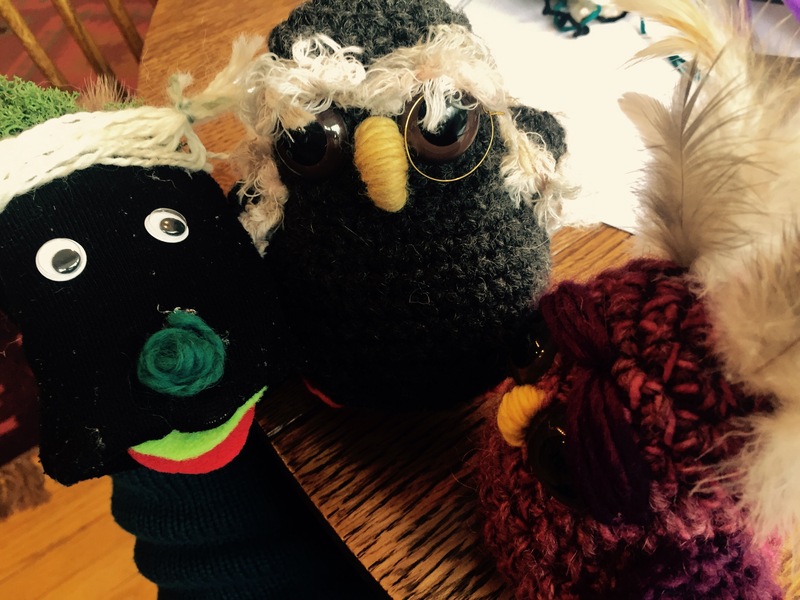 Categories: Fiber Art In Schools, Handcrafting | Tags: children, craft, creativity, fiber art, how-to, inexpensive, patience, puppet show, school, school craft, sock puppet, sock puppets, summer craft, teaching, tutorial, Vermont | Permalink.